It's called the Ring of Fire, a semicircle of violently shifting plates and volcanoes that runs along the edges of the Pacific Ocean, from New Zealand to Chile. The most seismically active region on the planet, the Ring of Fire has triggered countless quakes, volcanic eruptions and tsunamis, including the 2004 Indian Ocean tsunami that killed 230,000 people, mostly in Southeast Asia. That tsunami was set off by a 9.3-magnitude quake near the northern coast of Sumatra, Indonesia, a region that has been hit repeatedly by massive temblors, most recently a 7.6 earthquake in September that killed more than 1,000 people. 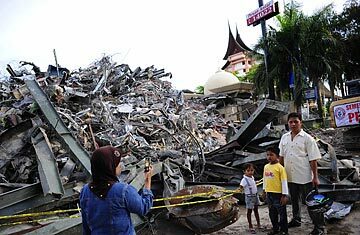 Sadly that's a relatively small quake death toll by Indonesian standards  and seismologists expect more to come in the future. See pictures of Indonesia's devastating earthquake.